Robert Whittaker was unable to defend his Ultimate Fighting Championship (UFC) Middleweight title last night (Sat., Feb. 9, 2019) against Kelvin Gastelum in the main event of UFC 234 in Melbourne, Australia due to an internal hernia. As a result, “Bobby Knuckles” underwent emergency surgery, as it was discovered he had a twisted and collapsed bowel on top of the already-existing hernia. Facing an extended road to recovery, Whittaker will remain in the hospital for a few more days and will face a lengthy road to recovery. Being the warrior that he is, Whittaker posted a video message for all of his supporters on Instagram updating us on his health. Hey guys ! Still kicking. I’m sorry to all my friends, fans and family for not being able to get in there Sunday. Apparently if you get emergency surgeries you can’t be cleared to fight. Thanks for the overwhelming support from all my fans I am so blessed to know you guys have my back. A big thanks to my team mates @fabricioitte @alexprates07 @standstrongboxingcoachjustin @justinlang_ep @titusday77 and all the others from behind the scenes you guys were there from start to finish worrying and prioritizing my health above all. Lastly to @danawhite and @ufc for the immediate help and support throughout the process of testing and the emergency surgeries. I am blessed I found out when I did and avoided life long consequences. I’ll be back better than ever. 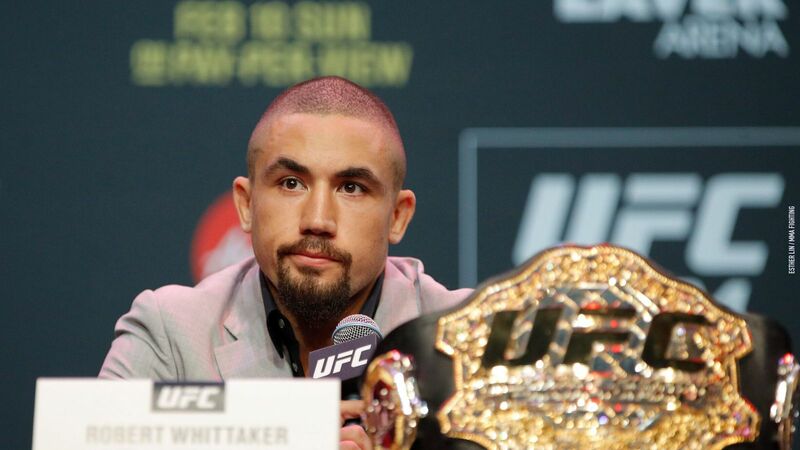 Despite his removal from the card, Whittaker is still UFC’s middleweight champion. As a result of Robert’s withdrawal, Anderson Silva and Israel Adesanya were bumped up to the headlining act and wowed fans for 15 minutes of striking action (full video replay here). As for what “The Last Stylebender’s” win over “The Spider” means for the 185-pound weight class remains to be see depending on Robert’s recovery time. That’s because Israel stamped his ticket to the big dance, though he won’t be able to tango until after Whittaker and Gastelum take care of their unfinished business. Above all else, Whittaker seems to be in good spirits following his double surgery. Just last year, Robert was bounced from his title fight against Yoel Romero — also in Australia — after a sever staph infection spread to his stomach. For complete UFC 234: “Silva vs. Adesanya” results, including play-by-play updates, click here. UFC Prague Start Time, TV Schedule, Who Is Fighting Today!